After I wrote the tree story yesterday, I thought about the fact that are so many times that we get confused between laws passed by government, for which a real penalty exists, and the ‘laws’ imposed by our culture and personal relationships. Most of us, me included, are often obeying rules implied by our society without even imagining that we simply do not have to do so. Usually the penalty exists only in our faulty thinking. This can cause us lots of problems. The name of the tree from yesterday is a good example. A group of people on one side of the issue gets all angered up about the name change, while the other side decides it will impose its will on the other side about what the tree will be called. This is a prime example of the forming of cultural or social law when no need exists for the law in the first place. It seems to me that the problem here is that so many of us believe we actually have to capitulate to these soft laws. Why else would the ‘Christmas Tree’ side of the issue care? Do they really think they will have to call it a Holiday tree? Do the folks on the Holiday tree side think they can’t call it a Holiday tree unless everyone agrees with them? Good luck, holiday tree side. The point is that we get ourselves involved in believing everything has to be done just as we want it done, and everyone else better be doing that way too. This is a form of self importance that can destroy relationships and create turmoil in a culture. Want examples of the self important person to an extreme? OK.
That’s a short list from me. I bet you can make your own list. All three create turmoil with their pompous self importance. I encourage you to begin to throw off the shackles of believing every social or cultural law requires your obedience. It may actually be your path to personal freedom and besides I need some fellow eccentrics. Some people will take you to task for what they consider your violations. Remember not to take their insults personally. The insult can’t send you to jail either. That last sentence reminds me of a wonderful story about former president Calvin Coolidge. The offended senator went immediately to Coolidge’s office and demanded what he was going to do about the comment. Coolidge told him to come back tomorrow and he would let him know. 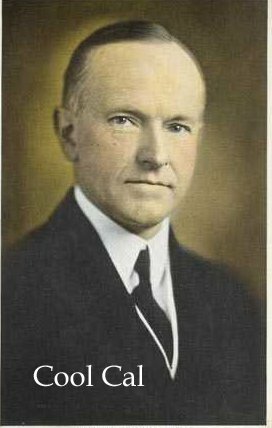 When the senator returned the next day, Governor Coolidge told the offended senator that everything was going to be alright.